have PIG FATS in them as ingredients. Lately We found the code E631 printed on the wrapper of LAYS POTATO CHIPS. The following images clearly show code E631 printed in the ingredients of LAYS POTATO CHIPS as flavour enhancers. 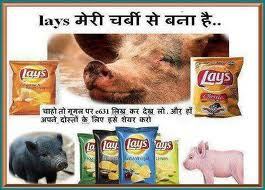 Pig is HARAAM for Muslims. SO we MUST avoid eating it. These idiots are playing with our beliefs and making us eat whatever has been rsetricted by Allah and His Apostle (PBUH). We must be raise our voices against this crime. Disodium inosinate (E631) is the disodium salt of inosinic acid with the chemical formula C10H11N4Na2O8P. It is used as a food additive and often found in instant noodles,potato chips, and a variety of other snacks. Disodium inosinate is used as a flavor enhancer, in synergy with monosodium glutamate(MSG) to provide the umami taste. It is often added to foods in conjunction with disodium guanylate; the combination is known as disodium 5'-ribonucleotides. Sodium salt of inosinic acid (E630), a natural acid, that is mainly present in animals. Commercially prepared from meat or fish (sardines). May also be produced by bacterial fermentation of sugars. Flavour enhancer. Inosinic acid and inosinates do not have the specific umami taste but strongly enhance many other flavours, thereby reducing the amounts of salt or other flavour enhancers needed in a product. None determined. Inosinates may not be used in products intended for children under 12 weeks. Inosinates are generally produced from meat, but partly also from fish. They are thus not suitable for vegans and vegetarians, and in most cases not suitable for Jews, Muslims and Hindus, depending on the origin of the product. Only the producer can provide information on the origin. Regarding the issue of E631 in Lays products in Pakistan we would like to refer to the Lays Pakistan Statement and the certification of Halal of Lays products. The inosinate is made from tapioca starch and no animal products are involved in the production. 8 Responses to "LAYS chips consists of E631 (PIG FAT)"
I am very confused as there is a halaal sign on the sweet chilli lays but has the E631 code in the ingredient can this be clarified!!! ان کی ہر پروڈکٹس کا بائیکاٹ کریں۔۔۔!! !